It was a 30-minute sortie. A wonderful and unique experience it was to 74-old-year 0ld Pratibha Patil, President of India. By the time she landed at the Lohegoan air force base in Pune flashing a victory sign, a record was created – she is the first woman head of state to fly in the front-line multi-role Russian made Sukhoi-30 MKI. She was seated in the co-pilot’s seat in the aircraft, with a ‘G-suit’ worn by fighter pilots to counter the gravitational effects due to high speed manoeuvres. The aircraft was flown by Wing Commander Sajan of the 30 Squadron. During the sorties, the President flew over an area covering Rajgurunagar, Shirur, Daund and Baramati before returning to the Air Force Station. The President flew at a height of about 2 kilometers above sea level and at a speed of about 800 kilometers per hour. The Chief of Air Staff, Air Chief Marshal, P.V. Naik and the Air Officer Commanding in Chief (AOC- in- C) of the South Western Air Command, Air Marshal P.S. Bhangu were also present at the air base during the sortie..
Patil’s predecessor, APJ Abdul Kalam, had set a precedent by becoming the first President to fly Sukoi. In a live media interaction, Prtibha Patil said she enjoyed the flight. 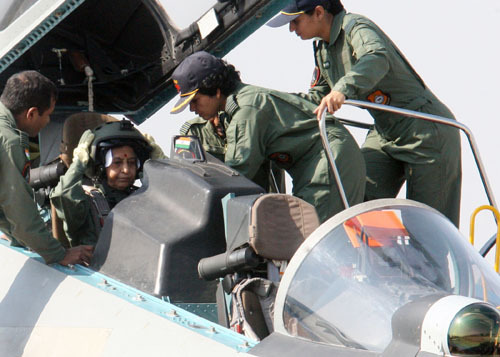 The flight, she added made her proud of the “efficiency and expertise” of t the pilots of the Indian Air Force . Russian President Dmitry Medvedev complimented the Pratibha Patil for the sortie. He said the historic sortie by the President of India has furthered strengthened the friendship, co-operation and partnership between the two countries. At last a great write-up in relation to the topic, continue the good work and also I wish to examine a lot more within you in the near future. Good for being going to your web site once more, it has been months for me. Effectively this post that i’ve been waited for so extended. I need to have this posting to comprehensive my assignment inside college, and it has similar subject together with your posting. Thanks, great share.